Jane C. Smith, age 91, died Friday, November 15, 2013 at her Anita’s Garden residence in Port Washington. 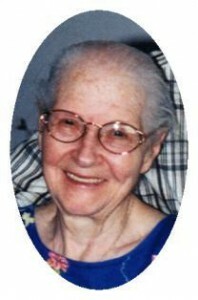 She was born May 12, 1922 in Lanark near Stevens Point, Wisconsin to Paul and Georgianna Scanlan Tilegard. She lived most of her life in Waupaca until she moved to Milwaukee, Wisconsin in the 1970’s. Jane worked as a Certified Nursing Assistant at numerous nursing homes, including the Jewish Convalescent Home for eight years and also at St. Michael’s Hospital and Children’s Hospital, both in Milwaukee. She enjoyed sewing and making crafts for her patients and residents of hospitals and nursing homes. She is survived by her children Enoch P. Smith of Milwaukee, Steve (Nancy) Smith of De Moines, Iowa and Cyndi (Ken) Schmitz of Port Washington. Further survived by 4 grandchildren, 5 great grandchildren, her sister Crystal Moon of Atlanta Georgia, other relatives and friends. She is preceded in death by sisters Dorothy “Dot” Wilson, Helen Tilegard and brother Lawrence “Bud” Tilegard. Pastor Carl Lehenbauer of Trinity Evangelical Lutheran Church of Friestadt will officiate services 6 pm Wednesday, November 20, 2013 at the funeral home. Visitation from 4 pm to 6 pm Wednesday at the funeral home. Interment will take place in Barton Cemetery in Waupaca County.